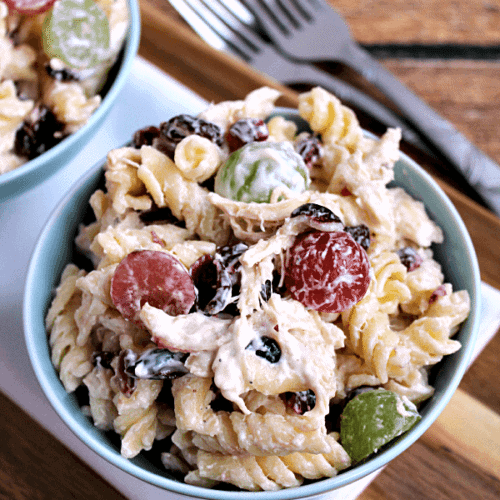 Cashew Chicken Rotini Salad ~ Loaded with Cashews, Grapes, Chicken, Pasta and Dried Cranberries! 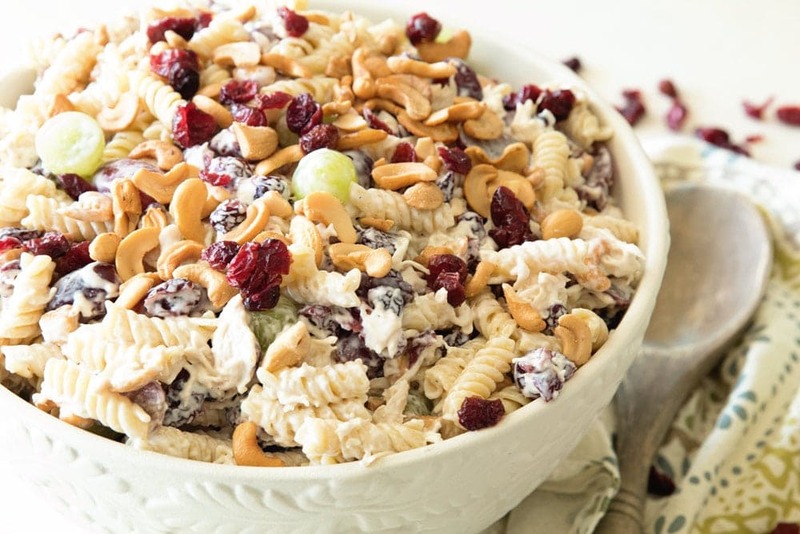 Perfect Pasta Salad Recipe for the Summer! This salad would be the perfect 4th of July side dish! Really, it’s perfect any time, all year round. Trust me, I make it all the time. 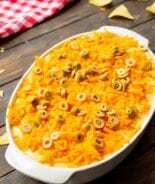 Any gathering and I’ll volunteer to bring the side dish and this is my go to winner! I made this last weekend for Kinzee’s baptism. I needed two different salads to make and this was one of them. I’ll share the other one with you soon! I love the juicy grapes in it and crunchy cashews. We had a wonderful day for Kinzee’s baptism. It was gorgeous out. A true gift from God. Bless my mom’s heart she hosted the dinner after baptism. My house is the size of peanut and we all love each other but we would have had to sit on each other’s lap to all fit in it! She made the famous Sweet ‘n’ Sour Meatballs and they were a hit like usual. 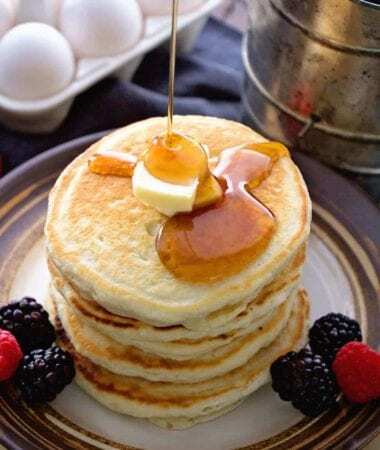 If you haven’t checked out this recipe you must! I think this salad was also a hit because my sister-in-law asked after dinner, “Hey, is this going on your blog?” I love it when when I get asked for recipes to go on my blog! 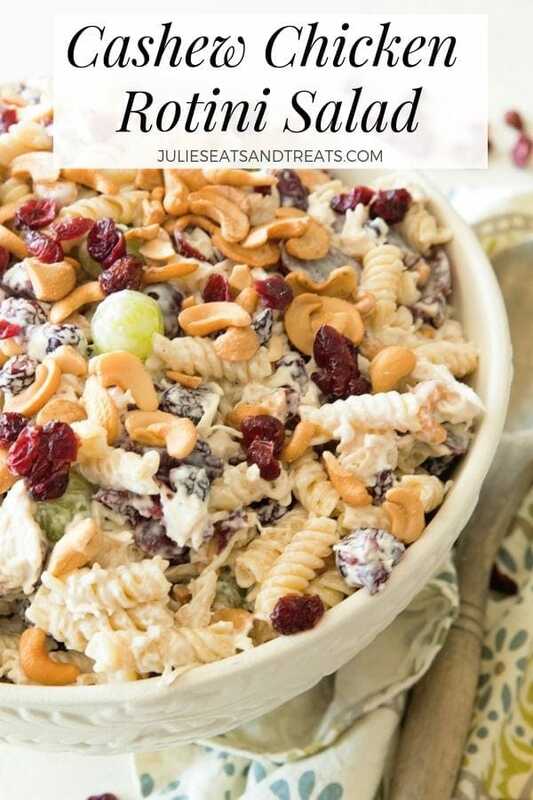 If you are looking for a delicious pasta salad recipe that’s a little different than the norm you guys have to try this! 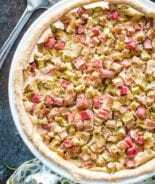 It’s loaded with so many amazing flavors from the chicken, grapes, cranberries and cashews. 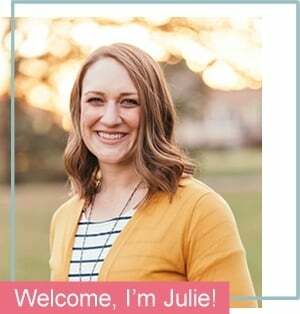 It is going to become your new favorite pasta salad recipe! 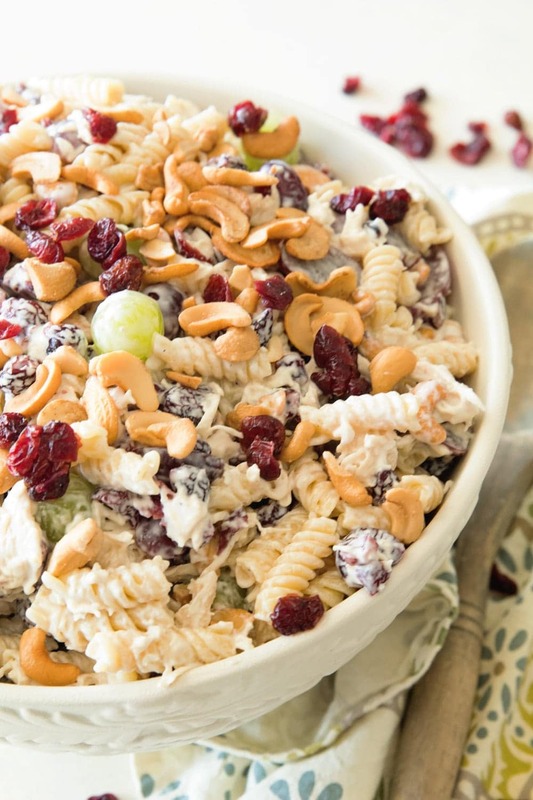 Loaded with Cashews, Grapes, Chicken, Pasta and Dried Cranberries! 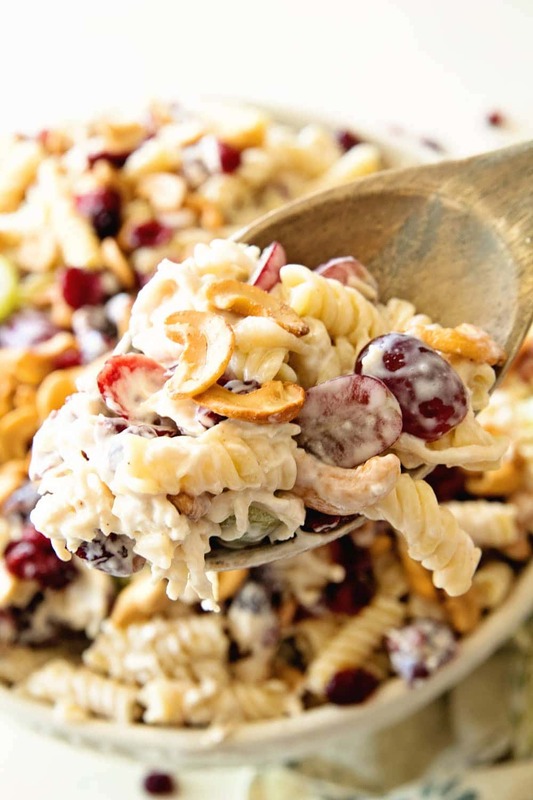 Perfect Pasta Salad Recipe for the Summer! In a large bowl combine chicken, grapes and cranberries. 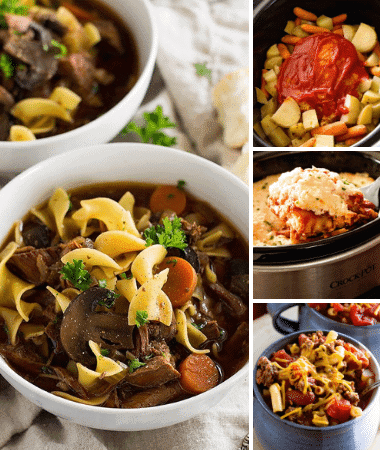 Add pasta. 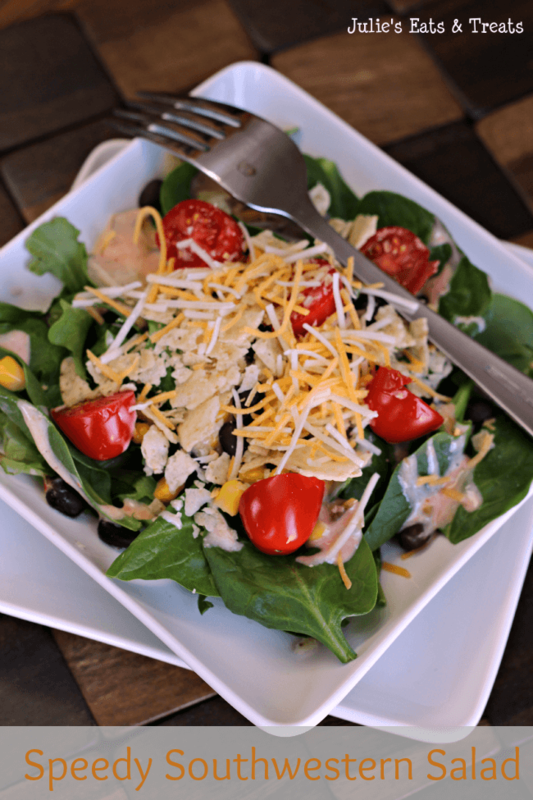 Speedy Southwestern Salad ~ Loaded with Black Beans, Corn, Cheese, Salsa and Ranch! 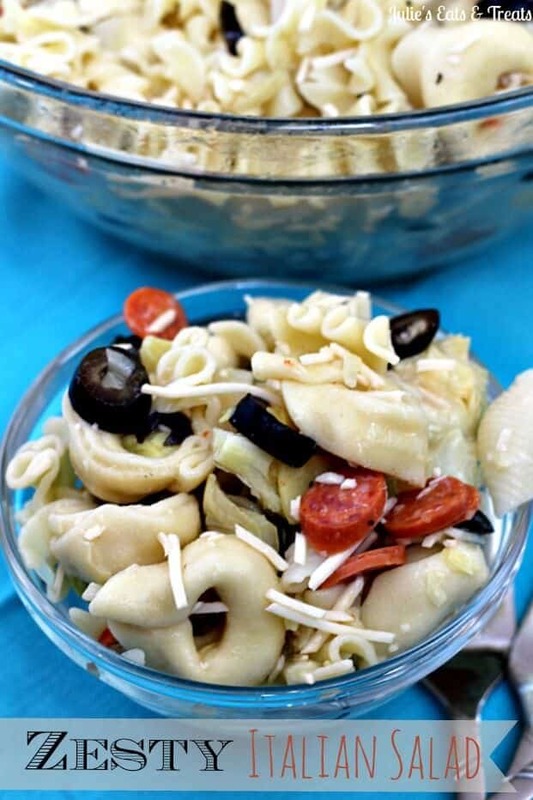 Zesty Italian Salad ~ Cold Tortellini Salad Stuffed with Black Olives, Artichokes, Pepperoni & Parmesan! 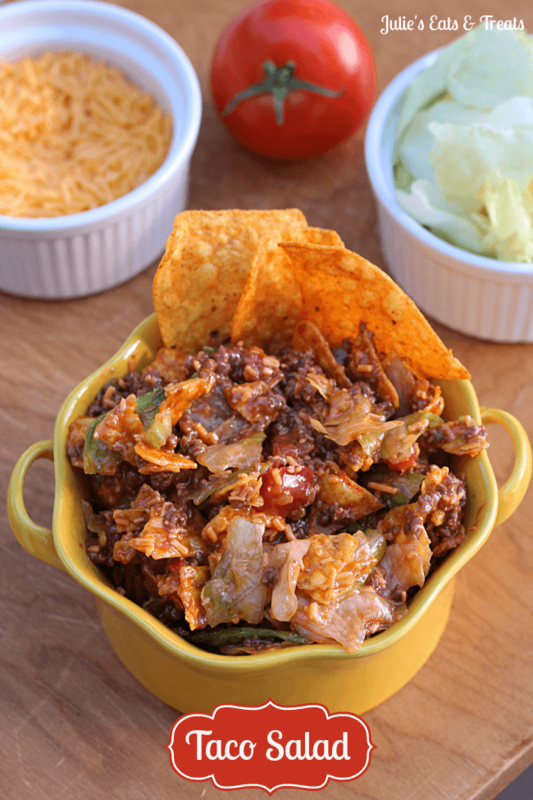 Taco Salad – Piled high with lettuce, tomatoes, cheese and chips! This salad is so good especially when made with homemade ranch dressing! If buying ranch dressing at the store, which brand do you use to make this recipe ? 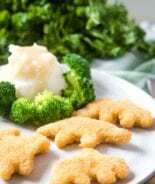 just curious if anyone had preferred any specific brand of ranch that tasted best with this recipe? 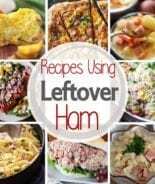 I use Hidden Valley ranch mix! Do you mix the pouch of ranch seasoning with the mayo? Or do you make the packet of ranch with mayo and then use more mayo. Mix with the mayo it calls for in the recipe. Oh that’s a great way to twist it! I would advice 3-4 days. 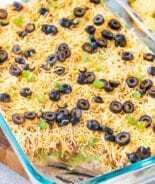 Looks yummyand great for summer get togethers. So, you have to cook the chicken in order to cut it up for the salad. I would imagine that you use boneless, skinless chicken breasts. How do you cook the chicken? I boil it in water and then shred it. Yes I used boneless, skinless chicken breasts.